Obituary for Lillian Kattel (Campos) Gabriel | Beach Funeral & Cremation Services, Inc. It is with great sadness that the family of Lillian Campos Gabriel announces her passing. She peacefully joined her Creator at her residence in Norfolk surrounded by her loved ones on Monday, November 26, 2018. She is now in God’s keeping. Born in Mankayan, Benguet, Philippines on November 8, 1943, she was the daughter of the late Maximo Campos and Evangeline Kattel Campos and a graduate of St. Mary’s School, Sagada, Mountain Province, Philippines and University of the East, Manila, Philippines. 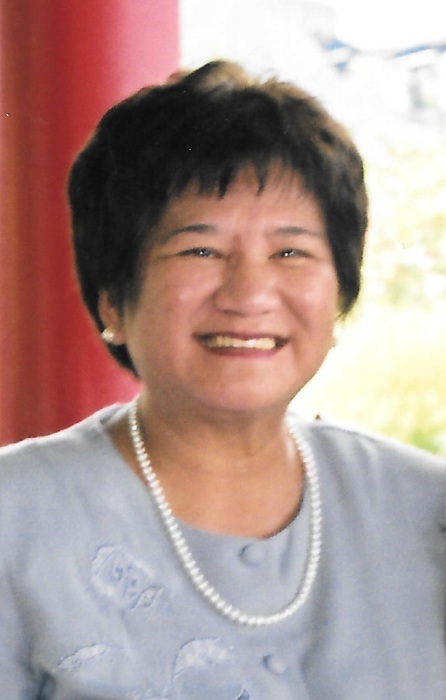 Lillian was a loving and proud Navy wife, devoted mother, doting grandmother and kind friend. She will be affectionately remembered by her husband of 51 years, Rudy Gabriel and children Errol Gabriel of Virginia Beach, Trenton Gabriel and Lynne Terry of Virginia Beach, Joy and Jeffrey Guilbert of Norfolk and Sheryl Gabriel of Virginia Beach and a niece who was like a daughter to her, Gail Campos of Norfolk. She will also be fondly remembered by her grandchildren, Carylyne Gabriel-Brooks, Maiya Gabriel-Brooks, Jacob Brooks, Eva Gabriel, Max Gabriel and Aiden Gabriel and many nieces and nephews. She is also survived by her brothers and sisters, William and Corazon Campos of Baguio City, Myrick Campos of Mankayan, Benguet, Pietro and Delia Campos of Mankayan, Benguet, Maureen Montero of Antipolo, Rizal, Janet Calupitan of San Pedro, Laguna, Jessica Campos of Perry Hall, Maryland, sisters- in- law, Clarita Campos and Elizabeth Campos of Mankayan, Benguet and are both predeceased by her brothers Cellong Campos and Agosto Campos. The family wishes to thank all who have taken care of her during her illness, especially the staff at DaVita Midtowne and an extended thank you to all her dear friends for their warm companionship and support. A private funeral with her family will be held on Saturday, December 1, 2018 at Beach Funeral Services. In lieu of flowers, donations may be made to the American Kidney Fund.